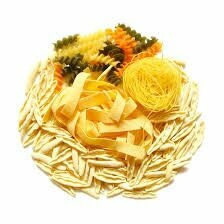 CASARECCE SICILIANE A L' ITALIENNE. GRATIN DE CROZETS AUX ENDIVES BIERE ET MAROILLES . CANNELLONIS AU VIC-BILH ET CHAIR DE CRABE . MACARONIS A LA LYONNAISE . NOUILLES CHINOISES ET POÊLEE DE LEGUMES . SPAGHETTI SAUTES A L'AIL . TAGLIATELLES A L' AIL DES OURS ET JAMBONNEAU. SPAETZLE AUX PETITS POIS .